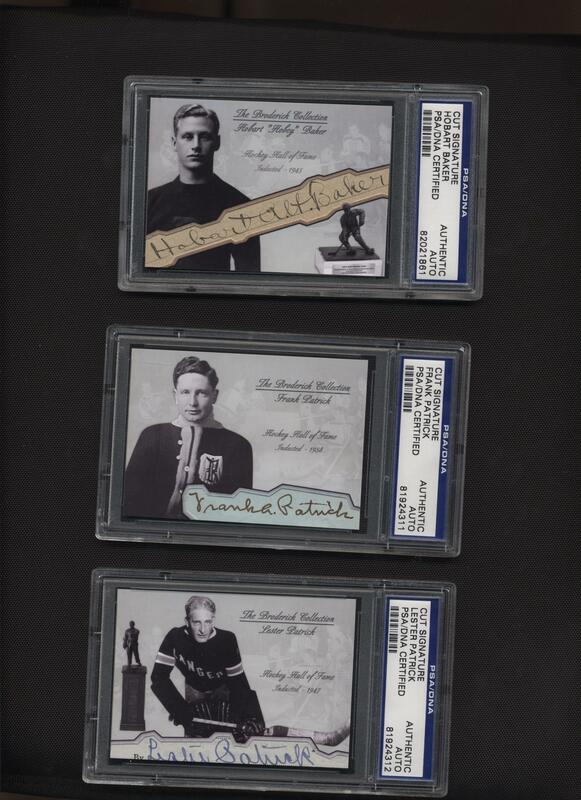 I could write up a whole blog post about how Topps lost their Player’s Inc license yesterday and probably won’t be able to produce football cards in 2010, but this being the “Year of the License” it shouldn’t surprise you that these things are happening. I’m not going to repeat everything that has been said already. Yesterday in the mail I received a copy of Insider’s Edge magazine and I came across an interesting article about Sean Broderick. 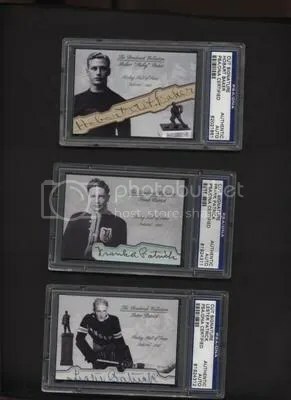 Mr. Broderick probably has one of the best cut signature collections The Hobby has ever seen, especially if your a hockey fan. His collection doesn’t consist of cards that were pulled from packs. Instead he purchases authentic documents signed by players such as Art Ross, Lord Stanley, and Georges Vezina. 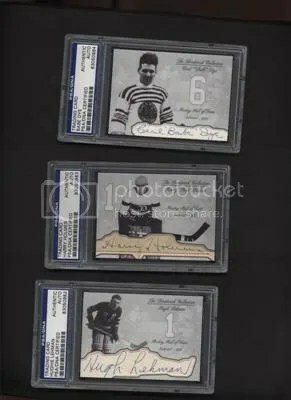 For those collectors not familier with hockey, these players are equal to Babe Ruth, Honus Wagner, Cap Anson, “Shoeless” Joe Jackson, Alexander Cartwright, and Jim Thorpe. In many cases these signatures are much harder to find. 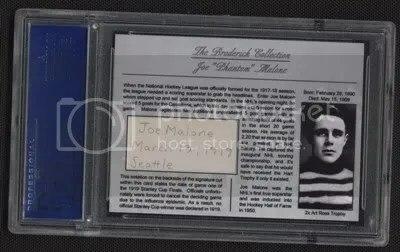 With help from Garret Morrison, these rare signatures are inserted into custom made cards just for Broderick’s collection. 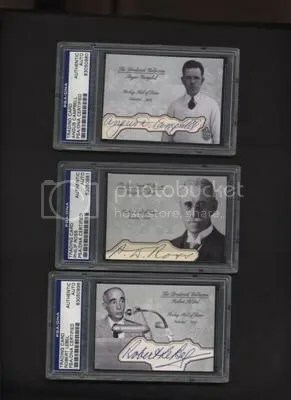 In the end they are slabbed and authenticated by PSA/DNA. 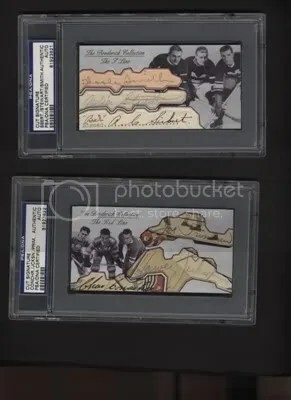 In my opinion, these are some of the best looking cut signatures I’ve ever seen. 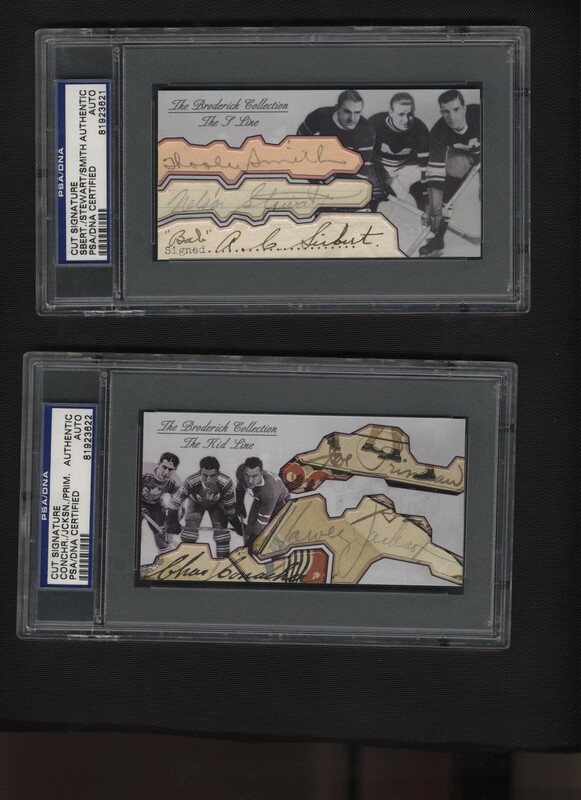 You rarely see photography like this on cut signatures. They have the perfect balance of photograph and autograph. Take a look at the windows too. Usually a cut signature is placed in a plain square. These windows have unique designs and cater towards the signature themselves. Mr. Broderick was nice enough to send over a few images for you to take a look. He is constantly looking for more signatures of players and donors from this era. If you have something you think he might need, please e-mail him at: seanieb21@hotmail.com. For a closer look, click on each image. 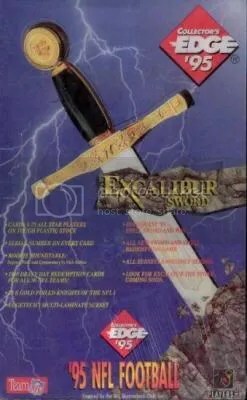 Who doesn’t love a product that has a huge sword on the front of the box? 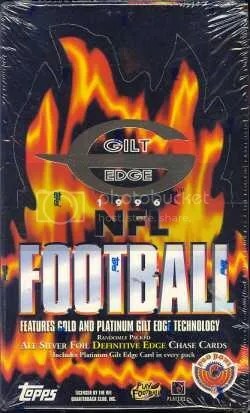 1995 Collector’s Edge Excalibur Football went in the strange direction of a knight theme set. Inside these boxes you can find inserts such as “Rookie Round Table” and “Dragon Slayers”. 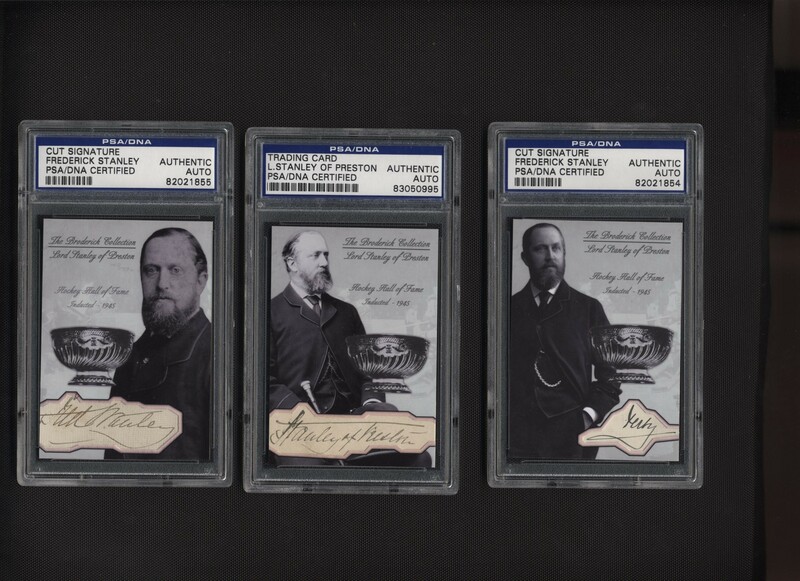 I’m not sure why Collector’s Edge would produce a set based around knights, but some of the cards look kinda cool. Boxes of this stuff can be found really cheap, usually for under $30.00. Maybe if 1995 would have had a better rookie class this product might have caught on more. I have to be honest with you, I’ve never heard about this product. Probably because it was issued all in one series and only featured players from that year’s Pro Bowl. It also doesn’t help because this product doesn’t contain any rookies. 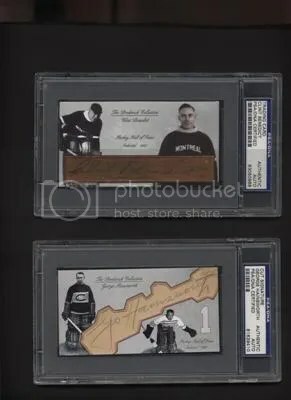 Topps was pushing their new “gilt-edge” technology where they place gold foil around the edges of the card. Each box contains 20 packs with 9 cards per pack. Boxes can be picked-up for around $20.00. I think the best thing about this product was the box design. You don’t see many products today with fire on them. 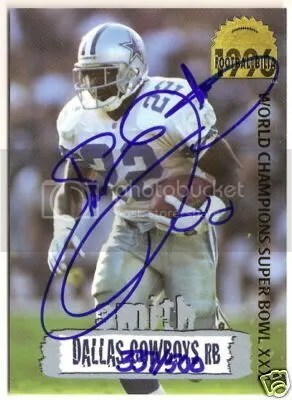 Question: There’s been a lot of Emmitt Smith Collectors Edge Cowboybilia # to 500 autos showing up. What do you think about these cards, real or fake? I read you guides and thanks for writing them. 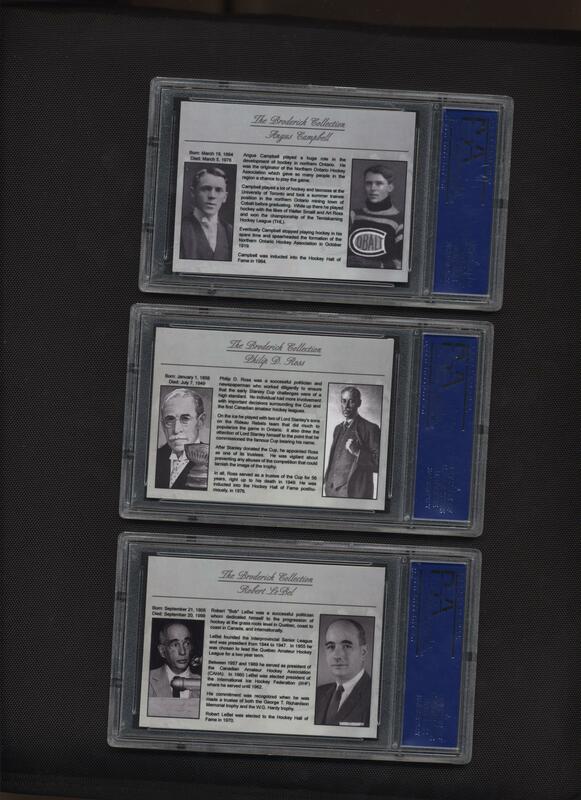 Answer: Yes, these cards are very real. Collector’s Edge is no longer in business. 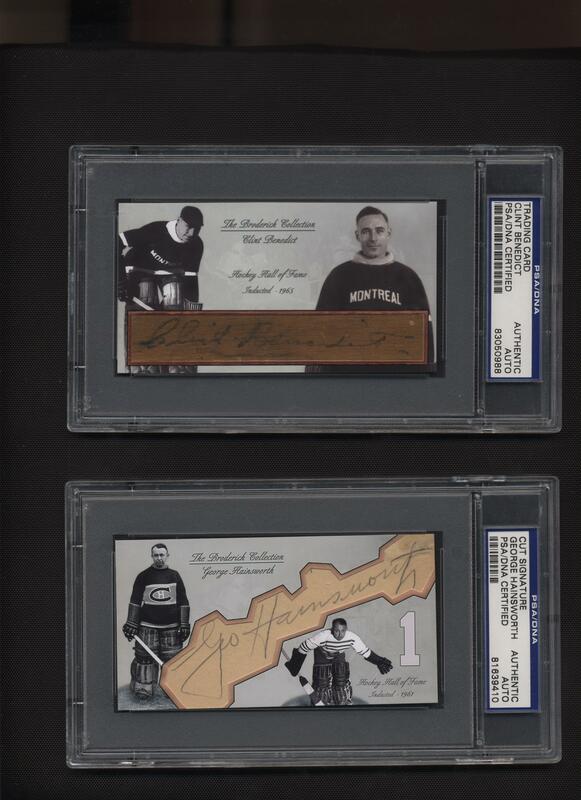 You don’t see many autographed cards like this anymore. 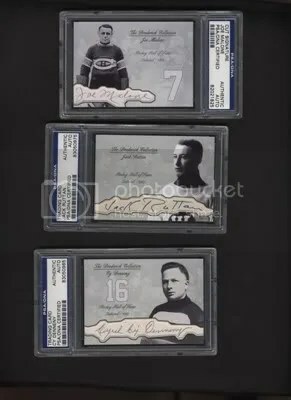 Autographs that are actually on the card and take up a good portion of the photo look great. Good old Don West. 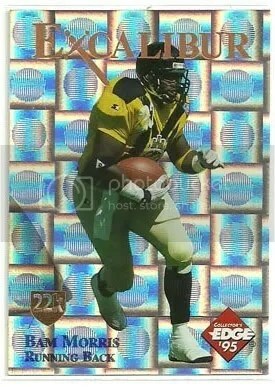 Does anyone miss watching him sell you overpriced sports cards? I do. I found this video on YouTube and thought it was entertaining. 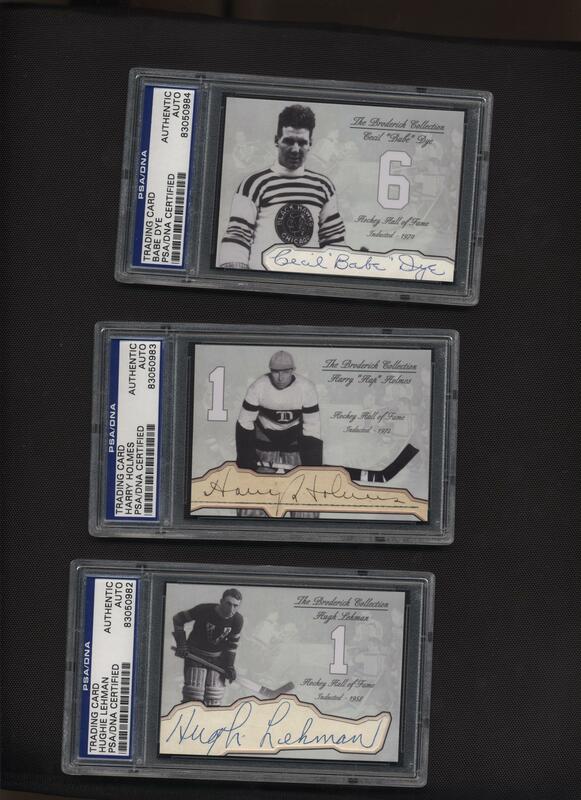 Some of these cards are limited to only 3,100 copies. It reminds me of when the first cell phones came out. “Its not a payphone, its a cellular telephone, and its only $8.00 per minute.” This was filmed at the pinnacle of when cards were being overproduced. If people are selling something on a Shop At Home Network, it probably isn’t very limited. You couldn’t pay someone $200.00 to open this stuff today. Enjoy!! !